As you probably discovered by now, in January I challenged myself to write a blog post about a quote that I really like. It took until the beginning of March to complete as I only got about 20 of the posts completed in January. Regardless, I stuck to it and completed all 31 posts. In February, I decided that I was going to be vegan. I went to the grocery store a few days before the month started and stocked up on all sorts of animal product free products. It was really hard to find bread that did not have any animal products but Country Hearth English Muffin Toasting bread was the day saver! I also found some french and italian bread made in the bakery that was vegan as well! I stocked up on some fruits, veggies, Boca burgers, soy milk, coconut milk, grape jelly and some oreos. Being as active as I am on change.org in signing their animal petitions, when I saw my peanut butter had palm oil in it, I knew that was related to a bunch of orangutans getting killed. A few minutes later I checked my Oreos just to be safe: Palm oil. Long story short, palm oil comes from the palm fruit, which is indeed a plant and vegan. 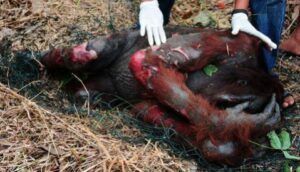 However, this fruit can only be grown in certain climates and is linked to deforestation and instead of cutting down the trees they are burned, which is leading to a ton of animals, especially orangutans being killed. I suddenly felt sick, how was I going to eat the Oreos I bought? (I had broke the seal otherwise I would have returned them). After weighing all the options with myself, I decided that I would eat the Oreos since they were technically vegan but I would not buy them again. After all, the only reason I went vegan to begin with was because all the animal cruelty was really getting to me. I believe all animals deserve to have a humane life. My causes page summed this notion up long before I decided to try veganism. And in this case, there was definitely not a humane outcome for these animals. If you think I’m making this up, here is another article to prove this and a lovely little image from the same article. A week ago when I went back to the store I bought some Smuckers Natural Peanut butter. Only ingredients were peanuts and a little bit of salt. No orangutans killed in the making of this peanut butter! My favorite meal was the Mandarian Orange meal from Gardein. I bought it a few times and each time I devoured the whole thing in one sitting. The best part? It cost the exact same as the General Tso’s chicken by Innovasian and no chickens were killed in the process! They also have a mailing list and will send you coupons, so that’s really a triple win. 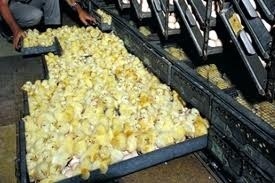 If you have any delusions regarding the cruelty in the chicken industry let me sum it up for you real quick: little fluffy peepers are transported on conveyor belts, some fall through and are dropped on to other conveyors to get all sorts of injections and then are placed on carts where they are taken to farms, they get so fat (if we fed human babies the same and jacked them up on so many steroids, that a human baby would weigh 600 pounds in two months) that they collapse on their legs. After 40 days they are hung upside down to be killed. Most break their wings flapping so much. There’s a video on my facebook if you’re really curious. Oh, and the super cute fluffy peepers who aren’t quite as fluffy, they get their heads ripped off or are thrown in with the egg shells and are put in grinders. This is also in the video if I’ve piqued your interest. After the first weeks I was a little tired of peanut and butter every day for lunch so I bought some tofu and veggie sausage and fake cheese and tofurky stuff. I ended up making tofu twice : once in my jambalaya (yum) and the other time I used coconut oil and brown sugar. I made tacos with the veggie sausage. All were delicious. All except the cheese. I love cheese. I’ve eaten so much cheese and so many different kinds that going without cheese was really the most difficult part of this entire month. I was really reluctant to try any other type of milk. I’ve never been someone who could just sit down and drink a glass of milk. But still, I was a little worried about this. I’ve had chocolate soy milk, and it’s great so I was mixing it with regular soy milk. But you know what, that was great too! Coconut milk definitely took the cake though. I wish they made coupons for that! I ran this until March 1st because there was one night I was honored with a few coworkers for a dinner and there was nothing vegan on the menu. So I ate chicken (this was before I saw said video mentioned above). Dinner was good but two hours later I was sick to my stomach. So since I technically cheated one day, I decided to follow this diet a day longer. So what now? Well, I’m going to stick to a more cruelty free diet. There will be more research involved with this so it may take a little bit longer to get the hang of it. But this means, ultimately, that I will eat “wild” fish – from lakes/oceans – not farm raised, and other foods such as : eggs from my father (or any local farmer where I can see those pretty hens out walking around), and cheese and meat that are local. For example, there is apparently a Kalona, Iowa dairy line, Kalona Supernatural. Thanks for pointing this out to me Hyvee! So that’ll be a good way to get butter and cheese. A little more costly BUT its 1) local (it’s about 45 minutes from my house) and 2) cruelty free. In terms of the meat, I’ll consume venison if someone takes a deer off my dad’s farm or beef or chicken that is local – to the point where I know where it is coming from. So yes, this is not technically vegan. The way I see it, all of us die in this system. What I want to try to ensure is that the animal had a good life prior to being killed. I mean, that’s not so much to ask for, right?